This is my first entry to CGSphere ([link]). What was it made with, and what was used to render it? THe scene was mostly modelled and rendered in megaPOV (a patch of POV-Ray). 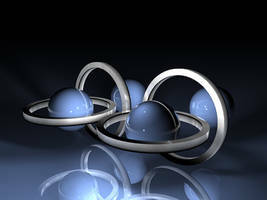 The basic scene setup is provided by the CGSphere project. I utilize HDRI for the render and the lighting is from an HDRI based lighting system I've been working on in megaPOV. I'm taking a look at megaPOV now - does it have a decent modeling interface? I'm used to Blender, but would be willing to learn this if it has a similarly efficient workflow. No it doesn't It is strictly SDL, that is, it is like a programming language, all text based. However, it does support meshes and scenes can be created in other modellers and converted to POV format. The SDL does have several advantages though. Procedural items and user-defined functions and objects can be implemented. Also, the base primitives (eg, spheres, etc) are actual mathematical objects with smooth surfaces rather than meshes. It can have somewhat of a difficult learning curve, depending on your knowledge of programming, mathematics and ability to visualize the 3d world. However, once learned, it can be quite powerful. I have been using it (POV-Ray) for over 13 years now (mind you I don't have experience in other programs and use POV almost exclusively, even for modelling) and have been able to learn quite a bit. Another bonus is it is completely free and open-source and also has a very active and helpful community. If you're interested, look at [link] for POV-Ray, [link] for megaPOV and [link] for the community newsgroups. Seems a bit intense for me, so I'll stick to Blender. Blender is free and open source. I had heard that people at one point coded 3D worlds rather than using a traditional GUI interface, but figured it was a dead practice. The grid provided for the backgroud tends to be a bit tough on the AA without really high settings.